This article is about the town in England. For other uses, see Macclesfield (disambiguation). Macclesfield is a market town and civil parish in Cheshire, England. The population of Macclesfield at the 2011 census was 52,044. A person from Macclesfield is sometimes referred to as a "Maxonian". Macclesfield, like many other areas in Cheshire, is a relatively affluent town. Situated in the ancient Hundred of Hamestan, the town is recorded in the Domesday Book as "Maclesfeld" and in 1183 it was referred to as "Makeslesfeld". The English Place-Name Society gives its name as being derived from the Old English name, Maccel, and field, yielding the meaning "Maccel's open country". Although "Silk Town" seems to be its preferred nickname, the traditional nickname of Macclesfield is "Treacle Town". This refers to an historical incident when a horse-drawn wagon overturned and split its load of treacle onto the street, after which the poor scooped the treacle off the road. Macclesfield was granted a borough charter by Earl Ranulf III of Chester, in the early 13th century, and a second charter was granted by the future King Edward I, in 1261. The parish church of All Saints was built in 1278, an extension of a chapel built in approximately 1220. The borough had a weekly market and two annual fairs: the Barnaby fair, was on St Barnabas day (11 June), the other on the feast of All Saints (1 November). In recent years the Barnaby fair has been reinvented as the Barnaby Festival, a cultural festival in mid-June. The weekly market no longer happens but on the last Sunday of each month the Treacle Market is held, a large market selling locally produced food and handmade items such as clothing, handmade goods and pottery. Macclesfield was the administrative centre of the Hundred of Macclesfield, which occupied most of east Cheshire. The Earl of Chester's manor of Macclesfield was very large, and its boundary extended to Disley. The manor house was on the edge of the deer park, on the west of the town. The Earls of Chester established the Forest of Macclesfield, which was much larger than its present-day namesake. It was used for hunting deer and pasturing sheep and cattle. By the end of the 13th century, large areas of the forest had been ploughed because of the pressure of population growth. In 1356, two trees from the forest were given to archer William Jauderell to repair his home. Macclesfield Castle was a fortified town house built by John de Macclesfield in the later Middle Ages. Construction began in 1398. Contrary to what some believe, no proof exists of Macclesfield ever being a walled town. When the settlement was first established and for some centuries afterwards there would have certainly been some sort of ditch and palisade round the western side of the town which was not naturally defended. This was necessary in order to keep out undesirable people and stray animals. No physical trace of a ditch remains though measurements and the shape of certain streets suggest where such a ditch could have been and most of the medieval building were within this area. It is unlikely that the ditch and palisade were succeeded by a wall for no record has been found of a murage tax, which would certainly have been levied to keep the wall in repair. The suffix "Gate" in the names of several Macclesfield streets has been taken to indicate the former presence of a gate in the sense of a guarded opening in a wall, however, this is very unlikely as the term 'gate' is derived from 'gata', Scandinavian for road, which became gate in Middle English. Therefore, Chester Gate, the Jordan Gate and the Church Wall Gate (some sources give the name Well Gate for this gate), are simply referring to the road to/from Chester or the road leading from the church to the well. These names are preserved in the names of three streets in the town, Chestergate, Jordangate and Back Wallgate. During the Civil War, in 1642 the town was occupied for the King by Sir Thomas Aston, a Royalist. In the Jacobite Rising of 1745, Charles Stuart and his army marched through Macclesfield as they attempted to reach London. The mayor was forced to welcome the prince, and the event is commemorated in one of the town's silk tapestries. Armoury Towers was completed in 1858 and the Bridge Street drill hall was completed in 1871. Macclesfield was once the world's biggest producer of finished silk. There were 71 silk mills operating in 1832. Paradise Mill is a working mill museum which demonstrates the art of silk throwing and Jacquard weaving to the public. The four Macclesfield Museums display a range of information and products from that period. Hovis Mill on the Macclesfield Canal in the town. Macclesfield is the original home of Hovis breadmakers, produced in Publicity Works Mill (commonly referred to as "the Hovis Mill") on the canal close to Buxton Road. It was founded by a Macclesfield businessman and a baker from Stoke-on-Trent. Hovis is said to derive from the Latin "homo-vitalis" (strength for man) as a way of providing a cheap and nutritious food for poor mill workers and was a very dry and dense wholemeal loaf completely different from the modern version. Between 1826 and 1831 the Macclesfield Canal was constructed, linking Macclesfield to Marple to the north and Kidsgrove to the south. The canal was surveyed for its Act of Parliament by the canal and roads engineer Thomas Telford, and built by William Crosley (junior), the Macclesfield Canal Company's engineer. It was the last narrow canal to be completed and had only limited success because within ten years much of the coal and other potential cargo was increasingly being transported by rail. Waters Green was once home to a nationally known horse market which features in the legend of the Wizard of Alderley Edge. Waters Green and an area opposite Arighi Bianchi, now hidden under the Silk Road, also held a sheep and cattle market until the 1980s. Macclesfield is said to be the only mill town left unbombed in World War II. Macclesfield was first represented in Parliament after the Reform Act of 1832, when it was granted two members of Parliament. This situation lasted until 1880, when after problems at the general election that year it was decided to declare the election void and suspend the writ of election (so no by-election could take place). In September 1880 a Royal Commission was appointed to investigate further. A report of March 1881 confirmed the allegations of corruption. As a result, the borough constituency was disenfranchised for corruption. The disenfranchisement took effect on 25 June 1885, when the town was transferred to the East Cheshire constituency. However under the Redistribution of Seats Act 1885 the Macclesfield constituency was recreated with extended boundaries, as a county division, later in 1885. From the 1885 general election it has elected one MP. Macclesfield has for some time been considered to be a safe seat for the Conservative Party, having been held by it since the 1918 general election. Currently, Macclesfield is represented by Gravesend-born David Rutley, a Conservative and practising Mormon. He was selected for this seat in 2010, when Sir Nicholas Winterton, who had been the incumbent for 38 years, announced his retirement following unfavourable press coverage relating to the claiming of Parliamentary expenses. Sir Nicholas' wife, Anne Winterton, held the neighbouring seat of Congleton. Macclesfield was governed locally by Macclesfield Municipal Borough (see Macclesfield (borough) until 1974 when Macclesfield Borough Council was established, a local government district with borough status. Following the establishment of Cheshire East Council in 2009 the borough was abolished and the Mayoralty transferred to charter trustees. Macclesfield Town Council was established in 2015 following a community governance review which established a civil parish. Macclesfield is in the east of Cheshire, on the River Bollin, a tributary of the River Mersey. It is close to the county borders of Greater Manchester to the north, Derbyshire to the east and Staffordshire to the south. It is near the towns of Stockport to the north, Buxton to the east, and Congleton to the south. 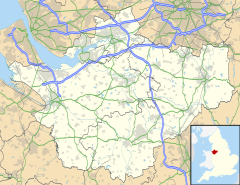 It is 38 miles (60 km) to the east of Chester, the county town of Cheshire. To the west of the town lies the Cheshire Plain and to the east lie the hills of the Peak District. The town is famous for its once thriving silk industry, commemorated in the Silk Museum. Macclesfield is also home to an Augustus Pugin church, St Alban's on Chester Road. Macclesfield is the manufacturing home to AstraZeneca, one of the world's largest pharmaceutical companies. The furniture store Arighi Bianchi was founded in 1829. The Georgian Town Hall was designed by Francis Goodwin in 1823. Other industries include textiles, light engineering, paper and plastics. Macclesfield station is on the Stafford to Manchester section of the West Coast Main Line and has frequent services to Manchester Piccadilly (25 minutes away), Stoke and London Euston (1 hour 47 minutes) by Virgin Trains, and to Birmingham New Street and beyond provided by CrossCountry. Northern's stopping service between Manchester and Stoke calls at Macclesfield. A railway station was first opened at Beech Lane by the LNWR on 19 June 1849 and replaced a month later by Hibel Road Station. The current station dates from the modernisation of the West Coast Main Line in the 1960s, when the old station buildings were demolished to make way for new buildings. On 26 July 1971, an electric multiple unit departed from Macclesfield station against signals and was derailed by trap points. Macclesfield is served by good road links from the north, south and west, but has fewer roads going east due to the proximity of the Peak District. From the south, access from Congleton and the Potteries is from the A536, and via the A523 from Leek. From the north, the main access to the town is the A523 from Manchester, Hazel Grove and Poynton. The main west–east road is the A537 Knutsford to Buxton Road. At various points around the town centre, some of these roads combine, such as the A537 / A523 on the Silk Road section, giving rise to traffic congestion, especially at peak times. The A538 provides access to Prestbury, Wilmslow and Manchester Airport, with the B5470 being the only other eastbound route from the town, heading to Whaley Bridge and Chapel-en-le-Frith. The Macclesfield Amateur Dramatic Society have performed at the Little Theatre on Lord Street since 1954. Macclesfield has been accused of having few cultural amenities; in 2004, research was published in The Times naming Macclesfield and its borough the most uncultured town in Britain, based on its lack of theatres, cinemas and other cultural facilities. The town is the birthplace of wildlife painter Charles F. Tunnicliffe RA OBE (1901–1979). The Silk Opera Company was created to perform 'The Monkey Run' at Barnaby. Macclesfield is also home to a Silk Museum and a number of art galleries. The Macclesfield Model Railway Group is nationally recognised as a leading railway modelling club, famous for many layouts since its foundation in 1954. Local newspapers include the Macclesfield Express and the Community News. Macclesfield residents have access to Macclesfield Forum, an online message board, for informal discussion of local news and issues. The town is also served by two locally based radio stations: Canalside Community Radio based at the Clarence Mill in Bollington, just north of Macclesfield, and Silk FM, a commercial independent radio station with studios in the town. Local information websites include Visit Macclesfield and the local what's on guide, Canalside's The Thread. The last remaining commercial cinema in Macclesfield closed in 1997. Discussions have taken place regarding the possibility of building a multiplex cinema, but attempts to build a cinema have thus far been unsuccessful. In 2005 a small-scale cinema was set up in the Heritage Centre, and Cinemac has since become well established; also based in the Heritage Centre is the Silk Screen arts cinema, which gives fortnightly screenings of art-house films. Amateur dramatics is well represented in the town: the Macclesfield Amateur Dramatic Society has existed since 1947 and performs in its own theatre on Lord Street. The Macclesfield Majestic Theatre Group has been producing musicals since its inception in 1971, initially at the Majestic Theatre (hence the title), but latterly at various other locations after the theatre was converted into a public house by the new tenants. Most recently, shows have been produced at the Heritage Centre, the Evans Theatre in Wilmslow and MADS Theatre on Lord Street. Several members of this society have progressed to the professional stage, most notably Marshall Lancaster and Jonathan Morris. Gawsworth Hall hosts an annual Shakespeare festival as well as many arts and music events throughout the year. Macclesfield has appeared in film: it was used as the location for Sir John Mills's film So Well Remembered in 1947. Some of the locations are still recognisable, such as Hibel Road. A fictionalised version of Macclesfield's railway station appeared in the 2005 football hooliganism film Green Street. It was also the location of Control (2007), a film about Ian Curtis, the lead singer of Joy Division. Macclesfield was the home town of Ian Curtis and Stephen Morris of Joy Division, and Gillian Gilbert, who along with Stephen Morris was a member of New Order. A memorial to Curtis is located in Macclesfield Crematorium. Other Macclesfield acts to have gained recognition include The Macc Lads and Marion. Silk Brass Band, the Macclesfield-based brass band, won the National Champions of Great Britain title in 2003. The blues singer John Mayall was born here in 1933. More recently, local band the Virginmarys has achieved national and international success. Chart-topping UK band The 1975 come from Macclesfield. In literature, Macclesfield is the second principal location of the fantasy novels The Weirdstone of Brisingamen and The Moon of Gomrath by Alan Garner. In 2008, the borough was named as the fifth happiest of 273 districts in Britain by researchers from the universities of Sheffield and Manchester, who used information on self-reported personal well-being from the British Household Panel Survey. Macclesfield is served by four state-funded academies (previously state high schools); Tytherington School, The Macclesfield Academy, Fallibroome Academy and All Hallows Catholic College. There are also two independent schools, The King's School which dates from the 16th century and Beech Hall School. Macclesfield Academy is made up of pupils from the former school Henbury High School, and also took in the pupils left over when Ryles Park secondary school closed in 2004. Ryles Park had been in turn an amalgamation of Ryles Park girls school and the oldest state school in the town, Macclesfield Central boys school, which closed in 1975. It is on the site of Macclesfield College and Park Lane Special School as part of the Macclesfield 'Learning Zone', which was opened in 2007. Macclesfield High School was the name originally given to the girls grammar school on Fence Avenue now forming part of the King's School. The hilltop church of St Michael and All Angels has views of nearby Kerridge Hill. [a] The church is approached from Water's Green by a flight of 108 steps, which themselves are a local landmark. Macclesfield Sunday School started in 1796 as a non-denominational Sunday School in Pickford Street, which catered for 40 children. It was founded by John Whitaker whose objective was "to lessen the sum of human wretchedness by diffusing religious knowledge and useful learning among the lower classes of society". Though chapels set up their denominational schools, the Sunday School committee in 1812 elected to erect a purpose-built school on Roe Street. The Big Sunday School had 1,127 boys and 1,324 girls on its books when it opened. St Alban's Church in Chester Road is an active Roman Catholic parish church. The church is recorded in the National Heritage List for England as a designated Grade II* listed building. It was designed by A. W. N. Pugin. Christ Church' is a brick-built redundant Anglican church in Great King Street. It is recorded in the National Heritage List for England as a designated Grade II* listed building, and is under the care of the Churches Conservation Trust. The church was in use until 1981. It remains consecrated and is used occasionally for services. Macclesfield's professional football club, Macclesfield Town, first gained league status in 1997 as Football Conference Champions; they had won that title two years earlier but were denied promotion as their Moss Rose stadium in the south of the town failed to meet Football League stadium capacity requirements. As of the 2016–2017 season, the Silkmen play in the Football Conference after relegation in April 2012. Youth football teams include Macclesfield Juniors FC, Macclesfield Saints JFC, Moss Rose Juniors FC and Tytherington Juniors. Macclesfield RUFC, the town's rugby union club, plays in National League One, following promotion from National League 2 North in the 2013–14 season. Macclesfield Chess Club is one of the oldest chess clubs in the country having been founded in 1886. Macclesfield's cycling club Macclesfield Wheelers is a local club for all cycling activities, from pleasure riding to racing. World-famous cyclist Reg Harris produced "Reg Harris" bikes in Macclesfield for three years during the 1960s. The local cycling campaign group is known as MaccBUG (Macclesfield Borough Bicycle Users Group). Formed in 1999, it campaigns for better cycling provision for leisure and utility cyclists. Macclesfield Harriers & Athletic Club is an active club with over 500 members. The club caters for all abilities and ages. There are sections for Road Running, Track & Field, Fell Running and Cross Country. In December 2006, Sport England published a survey which revealed that residents of Macclesfield were the 3rd most active in England in sports and other fitness activities. 29.3% of the population participate at least three times a week for 30 minutes. Since 1997, Macclesfield has hosted the annual British Lawnmower Race. Held over two weeks in December and using two of the town's largest parks (West and South) the race is every gardener's yearly highlight. The only year the competition wasn't hosted in Macclesfield was 2011 during a diesel shortage. Blessed John Shert (c.1544-1582) English Catholic priest and martyr,  executed during the reign of Elizabeth I, beatified in 1889. William Buckley, (1780–1856) escaped convict,  survived among Australian aborigines between 1803 and 1835, raised here. John Brocklehurst DL,  MP (1788–1870) silk manufacturer, banker and MP for Macclesfield for 36 years from 1832 to 1868. Sir John Henry Birchenough, 1st Baronet,  GCMG (1853 – 1937) English businessman and public servant. Alec Stokes, (1919–2003) scientist  who worked on X-ray crystallography and DNA was born here. Stuart Evers (born 1976) novelist,  short story writer and critic. Forbes Robinson (1926 – 1987) bass,  known for his performances in works by Mozart, Verdi, and Britten. Noddy Holder (born 1946) lead singer  of Slade, lives in the town. Ian Curtis (1956 – 1980) lead singer of Joy Division, lived and died there. He is buried in the Macclesfield cemetery. The Virginmarys (formed in 2009) rock band. Reg Harris OBE (1920 – 1992) track cyclist,  active in the 1940s, 1950s and 1970s. Peter Moores (born 1962) former England Cricket Coach, born and schooled in Macclesfield. Stuart Brown (born 1972) thirteen-time British National Sidecarcross Champion. Peter Crouch (born 1981) Burnley F.C. and England  international football player. Emily Whitlock (born 1994) a professional squash player,  world No. 14 in 2016. Geoff Lloyd (born 1973) radio DJ,  also known as the Geoff half of Pete And Geoff; Hometime show on Absolute Radio. Eckernförde, Schleswig-Holstein, Germany. The official status has existed since 1953, although was submitted to review in 2011 after the formation of Cheshire East Council. "Macclesfield" . Encyclopædia Britannica. 17 (11th ed.). 1911. 6. Quarterly, 1st and 4th a stag lodged, 2nd and 3rd a human leg couped at the thigh. ^ "Coordinate Distance Calculator". boulter.com. Retrieved 8 March 2016. ^ New Society, 9, New Society Limited, 1967, p. 933 "Maxonian" was originally coined to identify a group of alumni of King's School, Macclesfield at Oxford University as a portmanteau of Macclesfield and Oxonian, which was then applied to residents of the town in general. ^ a b Finney, Isaac. "Macklesfelde in ye olden time". Archived from the original on 8 February 2007. Retrieved 12 January 2007. ^ Scholes (2000). page 104. ^ "Macclesfield". Key to English Place Names. Institute for Name Studies, University of Nottingham. Retrieved 12 May 2012. ^ "A History of the Church". St. Michael's Macclesfield. Archived from the original on 21 July 2006. Retrieved 28 November 2006. ^ Clayton, D. J. (1990). pages 32, 33. ^ a b A history of Macclesfield. Macclesfield Borough Council, edited by Clarice Stella Davies, University of Manchester Press, 1961. ^ Streets and houses of old Macclesfield. John Earles, 1915. Republished MTD Rigg Publications, Leeds, 1990. ^ Silk Tapestries of Macclesfield. Archived 23 February 2006 at the Wayback Machine Retrieval Date: 15 October 2007. ^ "Cheshire Quarter Sessions". Cheshire Observer. 9 January 1858. p. 4. ^ "Macclesfield". Retrieved 19 August 2017. ^ Paradise Mill website. Retrieval Date: 15 October 2007. ^ a b Tim Boddington. "The Macclesfield Canal". Retrieved 28 November 2006. ^ "Missing movie classic unearthed by Macc Lad". Macclesfield Express. 31 August 2004. ^ Porter, Andrew (18 June 2008). "Conservative MPs Sir Nicholas and Ann Winterton broke Commons expenses rules". Daily Telegraph. Retrieved 15 June 2016. ^ Greer, Stuart (17 October 2014). "It's 'full steam ahead' for a new Macclesfield town council". Macclesfield Express. Retrieved 15 June 2016. ^ "Macclesfield Silk Museums Trust". silkmacclesfield.org.uk. ^ Earnshaw, Alan (1990). Trains in Trouble: Vol. 6. Penryn: Atlantic Books. pp. 28, 30–47. ISBN 0-906899-37-0. ^ Ben Turner (8 June 2010). "Debut for 'Monkey Run' opera". macclesfield. ^ "Cinema may replace Tesco and Hughes stores as new star in town". Macclesfield Express. Archived from the original on 29 September 2006. Retrieved 29 November 2006. ^ Cinemac. Retrieval Date: 16 February 2008. ^ Silk Screen Cinema. Retrieval date: 16 February 2008. ^ So Well Remembered. International Movie database website. Retrieval date: 15 October 2007. ^ Green Street (US title: Hooligans) International Movie Database website. Retrieval Date: 15 October 2007. ^ "Getting to know Dad". Macclesfield Express. Archived from the original on 1 December 2008. Retrieved 29 November 2006. ^ "[Interview] Matt Healy of The 1975 talks influences, origins and headlining Glastonbury". Some Kind Of Awesome. ^ "Britain's happiest places mapped". BBC News. 28 August 2008. Retrieved 2 September 2008. ^ "A step-by-step ESDS Longitudinal guide: Guide to British Household Panel Survey". www.esds.ac.uk. Archived from the original on 23 September 2008. Retrieved 2 September 2008. ^ Collins, Louanne (1996). Macclesfield Sunday School 1796- 1996. Macclesfield, Cheshire: Macclesfield Museums Trust. p. 7. ISBN 1-870926-09-9. ^ "Macclesfield Saints Football Club". Retrieved 15 June 2016. ^ Furness (1988); p. 126. ^ Macclesfield Borough Bicycle Users Group (MaccBUG). Archived 7 September 2011 at the Wayback Machine Official website. Retrieval date: 1 October 2007. ^ "Macclesfield Harriers & Athletic Club". Retrieved 15 June 2016. ^ Active People Survey. Archived 25 February 2010 at the Wayback Machine Sport England website. Retrieval date: 16 February 2008. ^ Morgan, J. (1852). The life and adventures of William Buckley. United States: Kessinger Legacy Reprints. ^ About Nick Robinson. http://www.bbc.co.uk. Retrieval Date: 9 January 2009. ^ John Mayall-Favourite Briton Retrieval Date:2 March 2009. ^ "Biography for Ian Curtis". www.imdb.com. Retrieved 18 January 2009. ^ Peter Moores. Cricket England website. Retrieval Date: 16 February 2008. ^ (Olympic) Brits to Watch: Ben Ainslie. http://www.bbc.co.uk. Retrieval Date: 9 December 2008. ^ World Cup Scouting - Peter Crouch. http://www.bbc.co.uk. Retrieval Date: 9 December 2008. ^ Mr. Methane Retrieval Date:2 March 2009. ^ Slater, Chris (23 March 2011). "Mayor flies to Germany at own expense in bid to save twin-town partnership". Macclesfield Express. Macclesfield. Retrieved 6 August 2016. Clayton, D. J. (1990). The administration of the county palatine of Chester, 1442—85. Manchester, United Kingdom: The Chetham Society. ISBN 0-7190-1343-7. Furness, R. A. (1988). The Cheshire Hundred (1888–1988): The centenary history of the Cheshire & North Wales Chess Association. Cheshire and North Wales Chess Association. Scholes, R (2000). Towns and villages of Britain: Cheshire. Wilmslow, Cheshire: Sigma Press. ISBN 1-85058-637-3. Wikimedia Commons has media related to Macclesfield. Wikivoyage has a travel guide for Macclesfield.